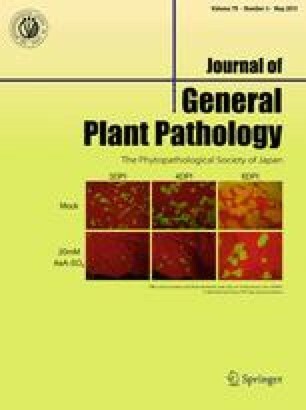 Phytoplasma-induced floral malformations such as virescence, phyllody, and proliferation were observed on hydrangeas in Gunma Prefecture, Japan. Phylogenetic analyses based on 16S rRNA, secY, groEL, and amp gene sequences indicated that the affected hydrangea plants were associated with phytoplasmas belonging to ‘Candidatus Phytoplasma asteris’, but not to ‘Ca. P. japonicum’, which occurs in hydrangeas showing phyllody in Japan. This is the first molecular evidence of an association of ‘Ca. P. asteris’ with hydrangea plants in Japan. Hydrangea phyllody (HP) Phytoplasma Hydrangea spp. This work was supported by Grants-in-Aids for Scientific Research from the Japan Society for the Promotion of Science, and by the Funding Program for Next Generation World-Leading Researchers (Project: GS005).